All three of my children have different tastes in food, Jake my eldest eats everything and has never been fussy at all, he loves fruit and vegetables and is the ideal child when it comes to meals, he will try anything. Chloe is far more fussy she has never been a huge fruit fan and will complain about the texture of food and is by far the most fussy of my three. Mikey is probably completely average, he has his favoured foods and won't budge on certain vegetables but does enjoy a wide variety of fruit. So when we were asked if we would like to give our opinions on the new Jelly Pots from Cross and Blackwell I thought it would be interesting to see what they were like. The pots are Disney Toy Story themed, which each flavour having a different character from the popular childrens film on the packaging. Thy are bursting with fruit and come in 6 different flavours. They contain real fruit juice and no artificial colours or preservatives. The pots are a good size 125g which may actually be a bit on the large size for young children. 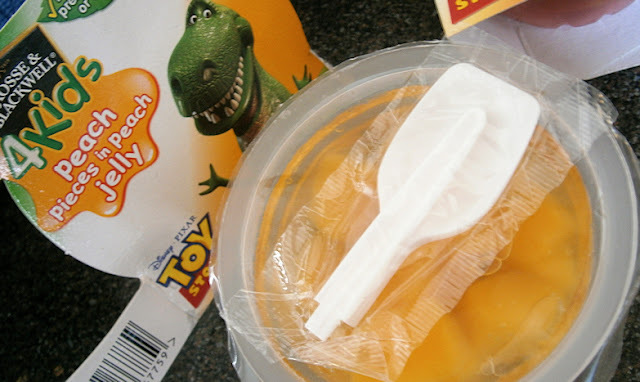 A handy plastic spoon is included which is a great added touch and makes these perfect for lunch boxes, a great way to ensure a fruit portion is included in the midday meal. 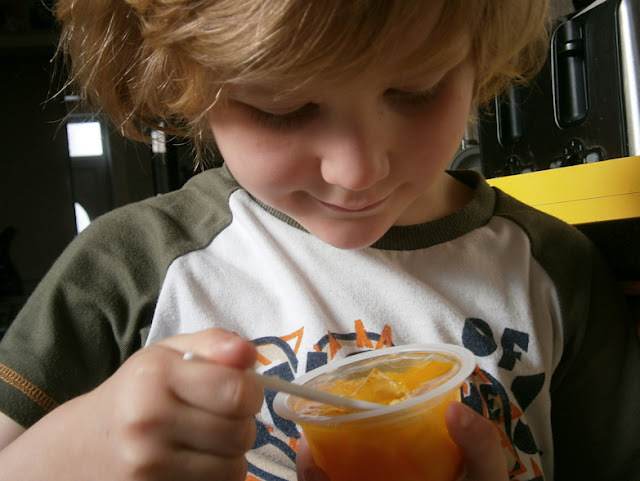 The Jelly pots can be refrigerated or just simply stored in dry cool place which means they taste great even if not kept cold in a school lunch bag. As expected Chloe was not kean on these, she did not like the fruit pieces - which there are ALOT of in each pot, Jake and Mikey enjoy them. 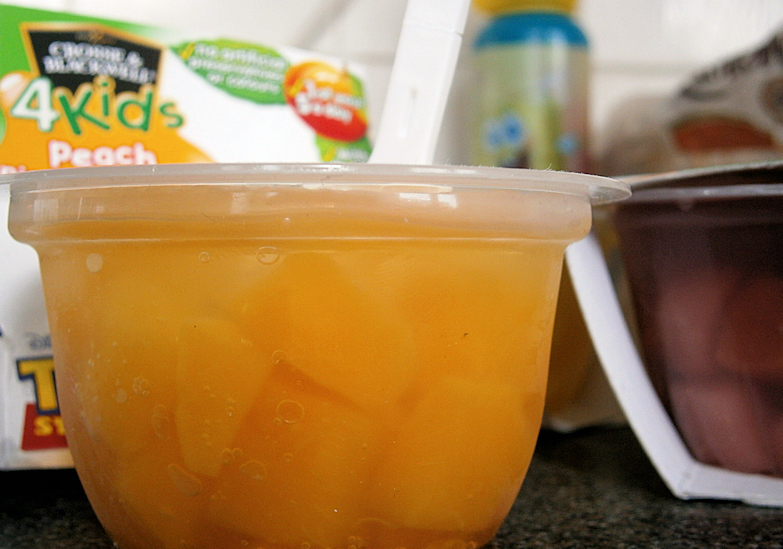 The fruit flavours gives a great selection of fruit, Pineapple, Mandarin and Peach along with Apple and Mixed Fruit. The Fruit chunks are nicely sized. The pineapple was our favourite, with a real pineapple flavour to the Jelly and the nice sized pieces of Pineapple was a really nice way to enjoy a fruit which we often overlook. 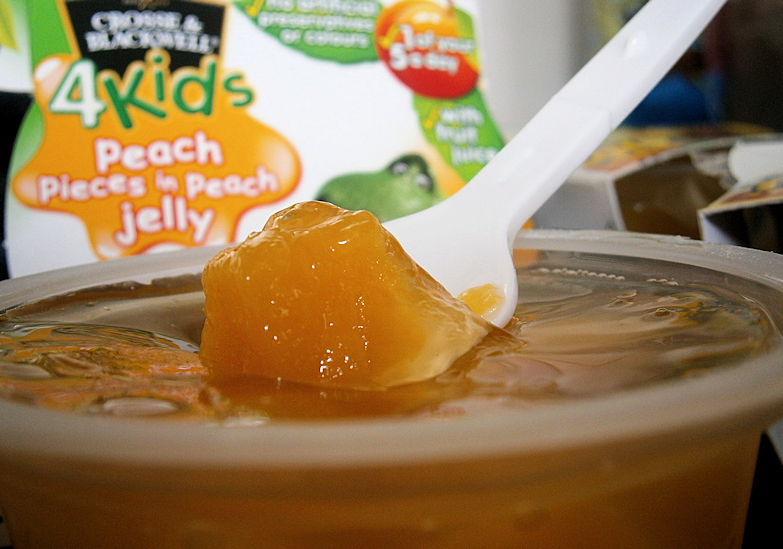 Overall these are great, and if you have fruit loving children then I would think they will like them, they are very natural tasting in the sense they do really taste of the fruit that is included. However if you have picky eaters who do not like fruit then they most probably will not like these. 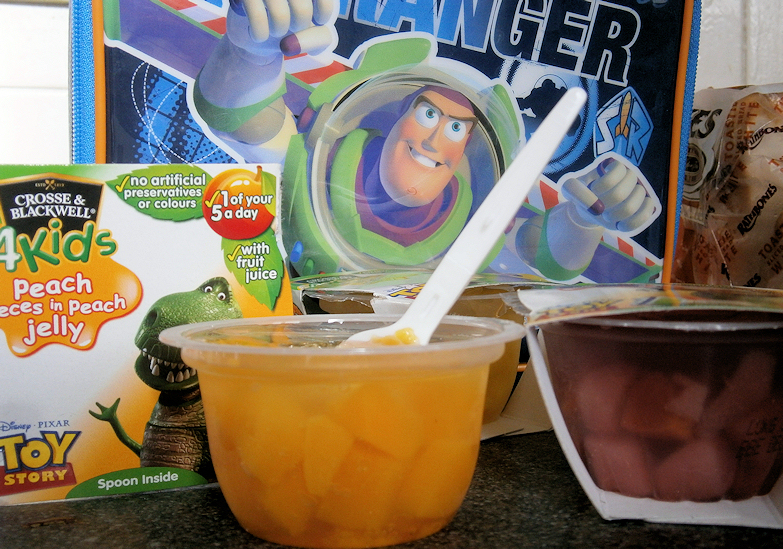 The draw to Toy Story is appealing, but of course once you take the outer layer off you are left with a pot of Fruit in Jelly. Priced at 65p a pot to me these seem a little on the expensive side to include in packlunch boxes on a regular basis and may be better grouped in a pack of 4 for a cheaper price. But certainly as a one off treat or for a family picnic then these are a great addition to any lunch.